NHL News : Chara pounds Martin in heavyweight fight that ends with surprising twist! Chara pounds Martin in heavyweight fight that ends with surprising twist! Why are NHLers trying to scrap this guy?! New York Islanders' Matt Martin should have known better. Everyone knows you shouldn't mess with Zdeno Chara. 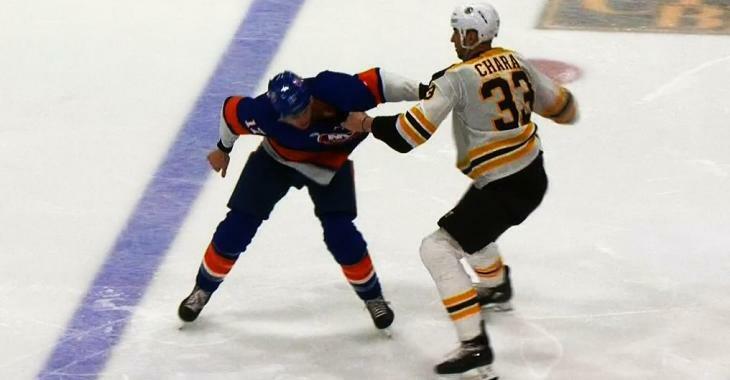 Martin and Chara dropped the gloves in the second period of Tuesday night's game between the Isles and Boston Bruins and, as expected, the giant blue liner came out on top. Martin's punches failed to come anywhere near the 6-foot-9 defenseman, while Chara manhandled and rag dolled the forward with ease as officials almost look frightened to stop him in his rage. Martin managed to get back to his feet and landed a blow to the defender, but it wasn't enough. The 42-year-old defenseman pounded Martin back to the ice and the linesmen finally saw an opportunity to stop the bout and send the players to the penalty box. However, Chara ended the fight with a surprising twist: as Martin attempted to get up - and back to his senses - the Bruins captain took to time to check up on him and appeared to speak to him in a king manner, almost in a very “good job little buddy!” kind of way. The Bruins' beast might still be undefeated in fights on the ice, he still keeps it classy. No one expected that, however, fans appreciate that Chara can fight anyone while remaining classy to check up on his opponent and keep it friendly. However, players around the league should get the message: don't scrap with this guy!